The 1939 Register recently became available on Ancestry. Whilst this is great news for subscribers who don’t have a Find My Past subscription, I’ve found that it’s not as easy to use as it is on Find My Past. Many of the Register’s entries only list a surname for the first person in each household. Ancestry have taken this literally in their transcriptions, resulting in a lot of people who are on the Register not appearing in the search results. 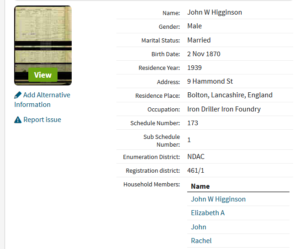 For example here is the Register entry for my great grandmother’s brother, John W Higginson, and his wife and children. 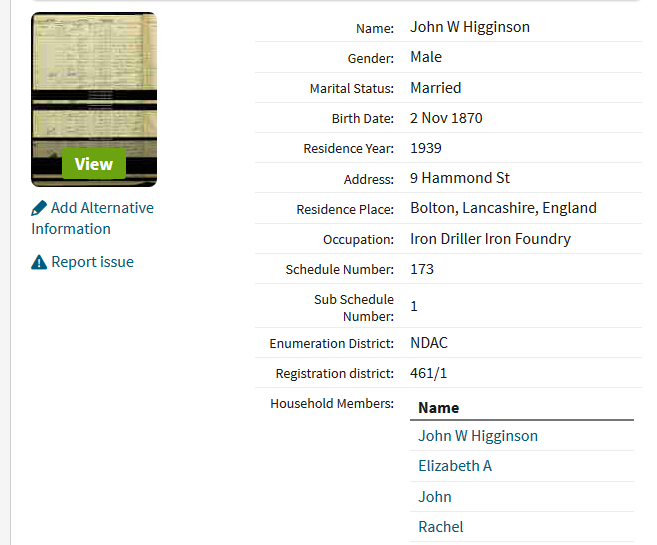 As you can see John W.’s surname is listed, but his wife and children’s surnames aren’t – this is the same for all the entries on their street and for many other entries in Bolton (and possibly other places). Find My Past have assumed that all the entries share the surname, Higginson, but Ancestry have left the surname blank in their transcripts. I understand that Ancestry’s transcripts are completely accurate – no surname is listed so no surname should be entered. However, this means that if I search for another family member, say John W.’s son, also called John, the search returns no results. The only way to locate him is to either search for his father or search with no surname – neither of which are ideal. If you’re struggling to find someone on the 1939 Register using Ancestry, try searching for any family members you know of, you should eventually find them. If that doesn’t work, try using just their first name, date of birth and location. Although this will take a lot of checking of entries, Ancestry does have the useful feature of showing a brief summary of each result when you hover on it, which should speed things up. I have submitted corrections on the entries I’ve come across, but whether Ancestry will accept them is yet to be seen. As I say, I do appreciate that strictly speaking Ancestry’s transcripts are correct. The 1939 Register is a snapshot of live in England and Wales at the beginning of World War II. It was taken on Friday, 29th September, under the National Registration Act of 1939, an Act of Parliament introduced as an emergency measure at the beginning of World War II. The Act also brought in identity cards which had to be carried at all times. It was repealed in 1952 after which it was no longer a requirement to carry identity cards in the UK.